Stepping inside a local hardware store is like stepping back in time. These charming and nostalgic places will provide you with all of the tools and professional advice you’ll need, no matter the project you’re working on. Here are the 10 best in Indiana. Fusek’s was established in June 2004 by Steve and Sue Fusek in the downtown Historic Lockerbie neighborhood in Indianapolis. Hardware was a much-needed element to make this area more livable and enjoyable, and Fusek’s was finally able to fill that void. The store is 10,000 square-feet and there is something for everyone. They carry brands such as 3M, Scotts, GE, Benjamin Moore, and more. Fuske’s also offers services such as scissor sharpening, vehicle remote placement, knife sharpening, screen repair, and glass and Plexiglas cutting. Hi-Way 3 Hardware store first opened in 1955, and has continued to serve as the community’s best hardware store for the last 60 years. They believe in providing excellent customer service, fair prices, and having a wide variety of inventory. One of the store’s other attractions besides hardware is the greenhouse, which is open year-round and offers annual and perennial flowers, vegetables, and other seasonal favorites. When you want a great hardware shopping experience, Hi-Way 3 Hardware is the place to go. Bear Hardware is your old-time hardware store, located in southern Nashville, Indiana, just outside of Brown County. The store is family owned and operated and prides themselves on providing friendly customer service. If you’re in the market for a new chainsaw, Bear Hardware carries and services a large selection of Stihl Chainsaws. In need of some new outerwear? Bear Hardware also carries a variety of Carhartt gear. Whatever your hardware needs are, Bear Hardware has it all and a great staff to answer any questions you may have. Fremont Hardware has been locally owned and operated since 1902, and is the place to go in Fremont for all your handyman needs. They carry supplies such as Sharkbite plumbing fixtures and a variety of Skil and Stanley products. The store also has a wide variety of farm and garden, as well as housewares. Fremont offers window and screen repair, blade and knife sharpening, small engine repair, as well as pipe cutting and threading services. If you need to ship a package via UPS, Fremont Hardware offers that service as well! Located off State Road 18 and Main Street in downtown Brookston, Corner Hardware has an abundance of products, from commercial and residential, even rural. Whether your project is inside or outside, Corner Hardware has it all. Their mission is to offer top-quality products and provide even better quality service. The friendly and knowledgeable staff is there to assist you, whether you’re a first time DIYer or a long-time pro. 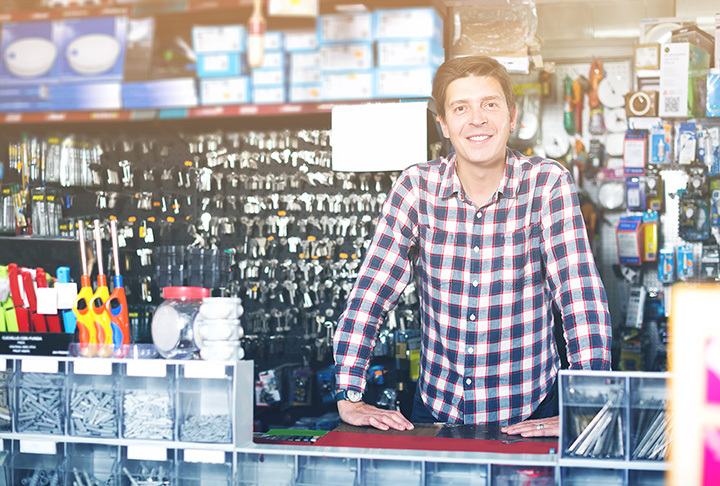 Kingman Hardware is the source for all your hardware needs, whether it be sporting goods, lawn and garden, pet supplies, electrical, plumbing, and more! They carry brands such as Purdy brushes and Valspar paint. Their motto is “If you need it, chances are we have it!” If you’re not sure what you’re looking for or have no idea where to start, be sure to ask one of their friendly and experienced staff members for help. New Palestine Hardware is another great, neighborhood hardware store and has been around for many years. They carry brands such as AMC, Wooster, Gunk, First Alert, Chapin, Flair-It, Great Neck, and more. In addition to providing a great selection of hardware supplies, they also offer services such as key cutting, propane exchange, pipe threading and cutting, window repair, lamp repair, and more. This truly is your one stop shop! Mister Hardware has been family owned and operated for over 30 years, providing Georgetown locals with various products for all their home improvement needs and DIY projects. They carry brands such as Zippo Hand Warmers, Pelican Coolers, Drinktanks Growlers, Kershaw Knives, Leatherman and more. It’s where quality meets convenience. Whether you need bolts, plumbing and electrical equipment, or lawn and garden, Mister Hardware has everything for everyone! LH Industrial Supplies in Lafayette, Indiana, has been providing the area with high-quality hardware supplies since 1977, when Frank Cheek started the store using his garage as a warehouse and selling items out of the trunk of his car. Since then, the business has grown and become a favorite among locals. The staff is friendly, knowledgeable and extremely helpful, especially if you are looking for parts that aren’t usually sold in other stores. LH carries brands such as Garryson, Sprayon, Alfa, 3M, and Dewalt, just to name a few. No matter your need, LH has it all! Santa Claus Hardware store in the infamous Santa Claus, Indiana, is more than just a hardware store. From nuts and bolts to building materials to home and garden, Santa Claus Hardware has so much to offer! If you don’t see something on their shelf, the amazing staff is more than happy to order something for you. They carry tools such as Stanley, Vulcan, Irwin Industrial, and more. In addition to selling hardware tools, they also do things such as propane fills or exchanges, re-keying of locks and lock servicing, as well as screen repair. It’s your one stop shop!